The brakes have been slammed on the Canadian real estate market. Back in October the Canadian Government announced they would be implementing new mortgage stress tests rules requiring insured mortgages to qualify at the posted rate of 4.64%. It was widely believed these changes to the mortgage industry would have an impact on future rates. Sure enough those predictions are coming to fruition. Just a few weeks ago TD Bank announced it was going to increase it’s mortgage prime rate to 2.85%. This meant a 0.15 increase for every customer holding a variable rate mortgage. Today, RBC announced they are increasing their fixed term mortgage rates. Rates went up by as much as 40 basis points on their 5 year fixed term rates. Perhaps this doesn’t sound significant, but it is. A mortgage with a 30 year amortization is now 3.04%. On an average Vancouver house, assuming you put 20% down, this would add an extra $260.33 to your mortgage. Doesn’t sound like much until you sadly realize Canadians are $200 away from being overwhelmed by debt according to recent surveys. Canadians going to renew their mortgages will be under further stress. The average Canadian already owes $1.68 in debt for every dollar they earn. Carelessly borrowing from the home ATM on the basis home prices will rise forever. 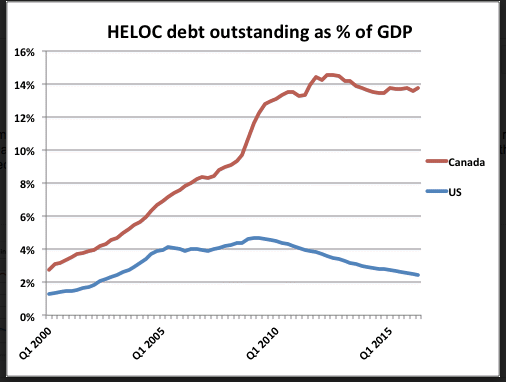 The amount of HELOC (Home Equity Line of Credit) debt outstanding continues to pile up. To add to this, it appears likely the Canadian Government will end up introducing risk sharing with the banks. Making them pay a deductible on default mortgages. Added costs to the bank will surely be passed on to the consumer. Just when you thought it couldn’t get any worse, the recent phenomena of Trumpflation could also bring higher mortgage rates. The bond market has imploded due to the fear of inflation from Trumps announcement of massive infrastructure spending and tax cuts. With our close ties to the US this will eventually push rates up here. If you’re about to get a new mortgage you better make sure to lock in for the long haul. No question rising mortgage rates will have an impact on house prices. Stay tuned.